When Dode Schneider, rattle-brained farmer, insists the abandoned Wyatt mansion is haunted by ghosts with big butts, Pawpaw County Sheriff Boots Gibson happily off-loads the crazy case to Ruby Jane Waskom and Veenie Goens, senior sleuths in training with the Shady Hoosier Detective Agency. Ruby Jane and Veenie, lifelong friends who live in the small Indiana town of Knobby Waters, aren’t afraid of the haunted mansion, built by a con artist banker who rowed out of town during the flood of 1919, taking the town’s assets with him. The crime-cracking duo set out in their smoke-belching 1960 Impala to uncover the truth behind the century-old haunting legend only to find surprise evidence of long ago murder and mayhem. 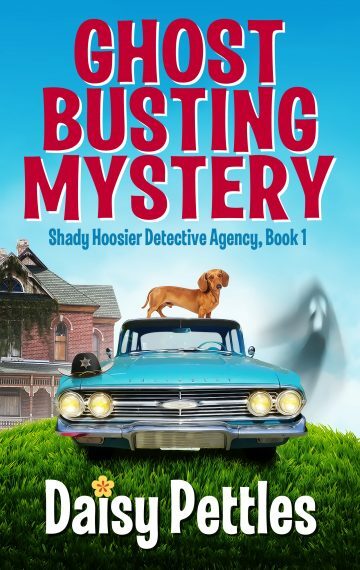 Along the way, Veenie and Ruby Jane chase down a missing drunk wiener dog, earn a lifetime supply of mystery meat sandwiches from Pokey’s Tavern, recover a stolen Harley Davidson, and uncover the startling truth about a long-cursed buried treasure. 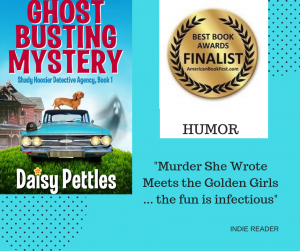 The investigation, which involves bank robbers and hillbilly hoodlums, doesn’t go smoothly, but Ruby Jane and Veenie, fueled by senior grit, and a desperate desire to plump up their retirement fund, engage in spirited hijinks that will leave the reader rolling in laughter in this crime comedy classic. Also available through the ebook subscription service, Scrbd, and on Overdrive at your local library. Retailers may order print copies from Ingram Spark.